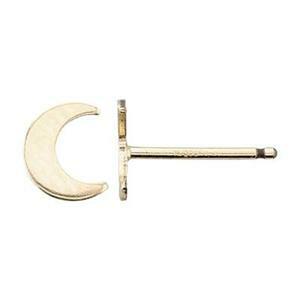 14/20 Gold-Filled 5x6.2mm 23 gauge Tiny Moon Stud Earrings, .8mm Post Thickness. Clutches not included. 10 piece pack is the equivalent of 5 pairs. It’s only a Crescent Moon. Glowing over an Earring Tree. But it’s pretty as it can be. If you make Jewelry. Our GF206R – 14/20 Yellow Gold-Filled 23 Gauge Tiny Moon Stud Earring. To make sure they stay in their orbit, please choose from our Gold-Filled Clutches to affix to your Posts.